Why Octopuses Could Never Disappoint : 13.7: Cosmos And Culture Evidence for smart, sassy octopus behavior once again impresses our resident cephalopod fan Barbara J. King, who is standing up for octopuses against a recent broadside. 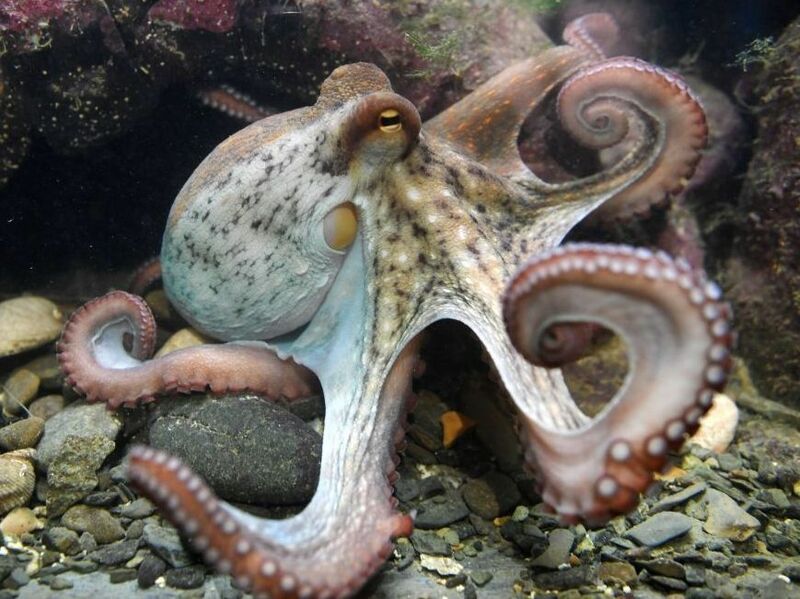 One writer refuses to downplay the attraction and achievements of the octopus. Over the past few years, I've spent many hours reading up on — and a morning observing — the smart, sassy behavior of octopuses. These cephalopods, who telegraph their moods by color changes and solve problems by using tools, have surprised me again and again. And now it's happened again. An octopus has astonished me. This time, it's a common octopus caught on camera in South African waters by a dive team for the documentary Blue Planet II, currently airing on BBC America in the United States. The action is dramatic. A pyjama shark seizes the octopus. Just as the situation begins to look dire, the octopus stuffs the shark's gills shut using its sinuous arms, making it impossible for the shark to breathe — until the shark releases it. That's cool and calm escape-artistry. But then, the same octopus is threatened again! David Attenborough narrates, praising its "superior wits." "The confused shark is simply left sniffing around the discarded shell pile. Such a complex use of the shells to create a temporary protective barrier is a testament to the ingenuity of this little cephalopod." Gloomy octopuses (that's a taxonomic term, not a mood descriptor) in Australian waters even build walls using shells of clams and scallops — their former meals — and shape them into dens. Yet not everyone responds to news like this of octopus ingenuity in the same way. In a column for Slate, Daniel Engber suggests that cephalopod enthusiasts vastly overrate the octopus. Octopuses use "simple motor programs" to move around, he notes, and often are slow to learn experimental tasks given them by scientists. "Rampant octophilia," Engber says, is about what we want to see in an animal that has come, faddishly in the past few years, to charm us. Octopuses have so "disappointed" Engber, in fact, that he has taken up eating them again after a long hiatus. His piece is illustrated with the image of an octopus carrying a little sign that reads "Eat Me." As I said in this space earlier this week — in a piece written before I came across Engber's — the impulse to take each new discovery of animal intelligence and rank it against other animals' intelligence is an impulse to avoid: "What if, instead, we just drank in each new discovery, scrutinizing it (because that is what science does) and welcoming it as a way to revel in the fullness of the natural and cultural world?" Dismissal of other animals' lifeways as "disappointing," I want to make very clear, is not scientific scrutiny. It's not scientific at all. So, today, I offer a few alternative ways to think about these amazing cephalopods. Octopuses have evolved for millions of years to be exquisitely adapted to their environments. That they use a mix of simple motor programs and thoughtful, learned responses isn't a disappointment (don't very many animals do the same?) but instead a window into how evolution works. Octopuses give us a breathtaking glimpse of life in our oceans. What octopuses don't do is as fascinating as what they do. It's all part of scientific discovery, and octophilia isn't only about sharing the coolest YouTube videos of brainy tricks. It's about appreciating these animals for who they are. We humans have a few limitations, too: If only we could camouflage ourselves against a background like octopuses can! Aiming to use our big brains compassionately, we might look hard not only at the practice, including here in the U.S., of eating living breathing octopus (see short video clip here) — but also at the practice of eating any octopus at all. In sum, I proudly own my "rampant octophilia." If, like me, you're on Team Cephalopod, I hope you'll own yours, too.